If your suspension is worn, a new aftermarket system can make a world of handling and braking differences. We show just how much! This article was first published in 2000. The human failings of complacency and over-familiarity with a car can result in dire consequences - perhaps in more ways than you could think possible. This neat little Zender body-kitted 318i BMW is a prime example. The owner, although heavily into motoring, had become accustomed to a car that wallowed like a half-filled old style waterbed. So much so that when I jumped into the driver's seat, I immediately became concerned about the safety aspects - it truly was an unsafe machine. In the event of emergency braking, the worn suspension meant that the car slewed all over the place, and of course handling was also heavily compromised. So a plan of action was undertaken. The idea was to cure the problems and improve upon on the factory-handling package. Brad Grant of Traction Tyres & Suspension in Rowville (Melbourne, Australia - 03 9764 2811), a company heavily involved in race car suspension design and fitment, suggested that all we needed to do to vastly improve the situation was to replace the shock absorbers, springs, and bump stops, and make some geometry changes. With thanks to Calder Raceway's management, we arrived at the racetrack to be met by our professional driver, Brett Youldon of The Driving Force (see breakout). Out came the witches' hats and the fun began. The intention was to steer the car through a number of evenly-spaced hats, starting at an easily managed speed (50 km/h), and building up in increments of 5 km/h until the vehicle became uncontrollable. Numerous runs were undertaken at each speed, with 50 and 55 km/h reasonably easily achieved, 60 km/h really pushing the point - and it was all over at 65 with the car only making the first two cones before spinning out of control! Runs were photographed, logged in the driver's memory and the times recorded as shown in the table above. Following a series of runs at a given speed, the driver was consulted for comment, notes were taken, and more runs completed. Next we embarked on a braking exercise, with Brett stopping the vehicle in the shortest possible distance from speeds of 60 and 80 km/h. Notes were taken in relation to the amount of dive (lots! ), the distance and time taken for each panic stop. Finally, the vehicle was driven full noise around Calder's amazing Thunderdome tri-oval. Said Brett: "The car was very loose, in particular on the slalom course where weight transfer from side to side and front to rear was significant. It was a real handful in that the steering felt heavy and lethargic, turn-in was very slow while lacking precision, and the weight transfer was so significant that even at 55 km/h the slalom felt very uncomfortable. "Body roll was of course the significant contributor to the appalling weight transfer, so much so that the steering became light with one wheel literally hanging and doing virtually nothing. With virtually no bump or rebound control, the effect was noticeable in all facets of driving, from the slalom, to the braking - where the rear would sit up and the front would dive to such an extent that the vehicle felt extremely unstable. The same feeling of instability was felt around the Thunderdome, to the point where the wallowing was unnerving, and the speeds had to be reduced, otherwise I feared the car would spear off into a wall. "It all came down to totally knackered suspension which quite literally dictated the terms. In fact, I would venture to suggest that to a large extent I was only along for the ride, with the soft unresponsive suspension dictating how things would go." Traction Tyres & Suspension expert, Brad Grant, took just two hours to fit a suspension combination suitable not only for Mr, Miss or Ms Average, but also for the enthusiast who enjoys fast country roads. For this he used internally adjustable Special D ('red') Koni shock absorbers designed to provide quality handling without the relative harshness of the up-spec externally adjustable Koni Sport ('yellow') range. In addition, King Springs - offering around a 30 percent rate increase and reduced ride height - were ordered, along with new bump stops. The stock old front strut shows clearly the knackered bumpstop. The old and new front strut inserts. The Koni 'red' is internally adjustable for rebound stiffness, but this adjustment can only occur with the damper removed from the suspension. Comparing new and old front springs...what a difference! The new spring is both shorter and also has a variable rate. Fitting new rear shocks - again Koni 'reds'. The BMW uses semi-trailing arm rear suspension, meaning that the spring rate is much higher than the wheel rate. A comparison of the new and old rear springs show that both are use the same design. These conical springs can be compressed a long way before spring binding occurs. With all corners in position, the car was driven to allow the suspension to settle, then placed on the Beissbarth front-end aligner. Brad employed various front-end geometry changes to ensure positive turn in, a greater footprint when cornering and improved feel. The specifications employed were: 2.7mm toe-in, 1.5 degrees negative camber and 8.5 degrees of caster. Brad's only concern was that the shocker settings would be too soft, which proved the case. Indeed, this led to a return trip and adjusted-up rebound rates on the front inserts. The fitting of the new suspension lowered ride height by the amount that can be seen in the table and two pics. ...and the ride height after! Talk about a transformation! The difference was marked both on the road and on the racetrack. Granted, over extremely rutted roads, you could feel the feedback through the car, however the good points by far outweighed the bad points. Feel was infinitely better, the car actually turned in when you wanted it to, mid corner was steady and body roll was dramatically reduced. 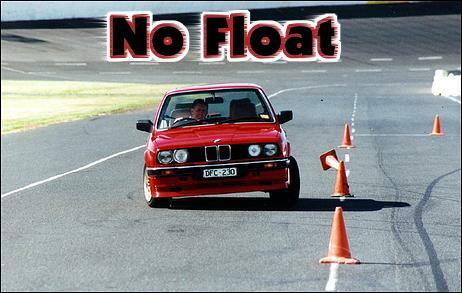 As can be seen, the car could now negotiate the slalom at higher speeds and with more control. Said Brett: "I am extremely impressed with the improvement, I mean quite literally the car has been transformed. Change of direction is so much more precise, it no longer suffers from roll oversteer, is vastly more stable during braking and I can now drive it flat out around the Thunderdome without the fear the bumps unsettling the car and throwing us off into a wall. The only real downside from a true performance enthusiast is that the new suspension has led to increased 'push' or understeer. However, this trait is great for most people in that it's an early warning system to indicate it's time to slow it a little. "The overall improvement is so significant that I would highly recommend everyone thoroughly check the suspension on their vehicle. It makes for a much safer, more consistent vehicle offering lots more feel, vastly more progression and ability." As can be seen the car was much more stable in the slalom where it achieved an additional 10 km/h and thanks to more precision took less time to complete each run. Likewise, in the braking test (pictured), the flatter, more progressive stance was obvious. The retail cost of the four shock absorbers, four springs, bump stops, labour and alignment is A$1310, and the package is available from any Koni supplier or of course Traction Tyres & Suspension. Having since driven the 318i on a few occasions, I can confirm that it feels like a new car. Confidence is restored to the point where the vehicle owner has learned to enjoy the car all over again. Brett Youldon's The Drive Force advanced driving school has been in operation for some years and is run by a range of extremely experienced drivers, of course including Brett who has been a motorsport competitor for 18 years. His company runs a large range of courses at various venues throughout the year, including Preventative Car Control, Car Control and Performance courses. The Driving Force operates out of Melbourne (Australia) and can be contacted on 0418-517 600.